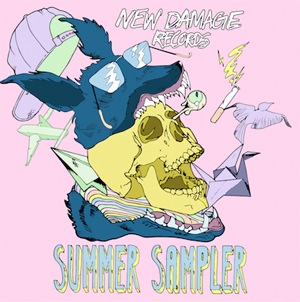 Toronto-based heavy music label New Damage Records are excited to announce that the second edition of their annual summer sampler is now available to download HERE. Drawing from the label’s ever-expanding roster, the folks at New Damage have curated the perfect summer mix. The 2016 compilation features 15 tracks from some of 2015/2016’s finest New Damage releases, including COUNTERPARTS’ Tragedy Will Find Us, CANCER BATS’ Searching For Zero, NORTHLANE’s Node, SILVERSTEIN’s I Am Alive In Everything I Touch, and the self-titled debut from Hamilton’s DEAD TIRED, to name a few. It also features new additions to New Damage’s expanding roster, including tracks from Niagara’s HEAVY HEARTS, Oakville’s COLDFRONT and Toronto band SAFE TO SAY, as well as brand new tracks from EXALT, SPARROWS and a special cover of Alanis Morissette’s “Hand In My Pocket” by Oakville’s very own SEAWAY. As if all that great music wasn’t enough, New Damage Records has added a contest component to make things even better. Anyone who shares the 2016 Summer Sampler with friends via the contest page HERE will instantly be entered to win the ultimate fan prize pack from New Damage Records, which will include a $100 Fred Perry voucher, a Treadwell Clothing merch pack, a Hex iPhone case, a pair of VANS shoes, a t-shirt courtesy of ADIMS Agency, Skull Candy headphones, as well as plenty of New Damage Records CDs and swag. Safe to Say - "Your Favourite Dream"
Exalt - "Sacrifice To Purify"
Cancer Bats – "True Zero"
Dead Tired - "All Hands"
Life In Vacuum - "Black Snow"
River Oaks – "Let You Down"